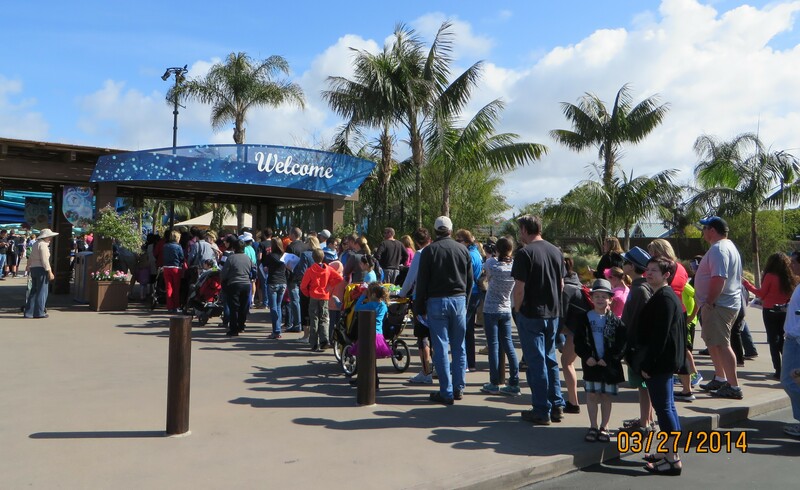 With good weather so rare, we decided we had to go to SeaWorld, right? There would be water there, I’m pretty sure. Some splashing. Maybe some wet rides. All good things on a warm, sunny day. The only question was, how long would it last? The sun, that is. We parked in the preferred space cuz I like to feel special. The guy who took my parking money told me to put on my flashing lights so the parking attendants would know I’m special. Good, because when I drive 50 min with my flashing lights on at home, everyone pretty much assumes I’m special as well. It’s why they honk at me. Anyway, when he said it, I had no idea where the flashing light thingee was in the car. I must have looked at him with a mixture of confusion and terror that sometimes gets misinterpreted as constipation. But in this case, he knew the problem immediately and pointed to the button in the center of my dashboard. I wouldn’t have been able to find it if they said they’d shoot one of the kids if I didn’t. But he found it right away. I guess he knows his Galants. So I drove through the parking lot with my flashing lights on thinking it may be some kind of joke. We parked right beside all the handicap spots. In ‘the special’ spots. We got out, warm sun on our faces, and went to stand in line to have our bags searched. Detecting no bombs, alcohol or non-organic, fair trade coffee grown on the shady sides of mountains in politically incorrect countries, we were let through. Then we came to the gate. Now, normally, you hand someone your pass or, in my case, the printed tickets, and they take care of everything. Why? Cuz they kinda, usually, know what they’re doing. Not here. We had to scan the tickets ourselves which everyone seemed to have a problem with so the attendant would usually take over and scan it for us. Then we had to have our fingers scanned. Why? I’m not sure. 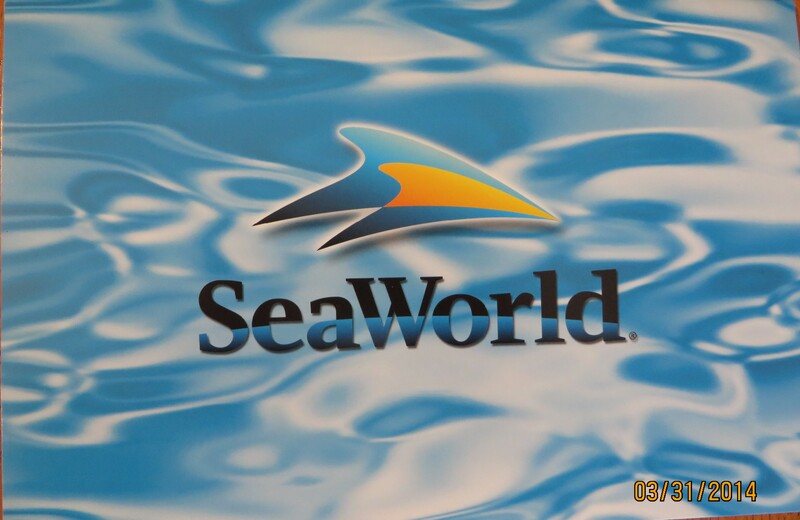 If someone stole Shamu did they want a record of the finger prints? Or were they looking for certain people like pedifiles or people who littered? Or was it a way of matching up missing people. Either way, it was odd and took a long time. Basically here’s what happened. We came up. Looked at the attendant, expecting him to take the tickets. He pointed to the scanner. Oh, says I, we have to do this our selves. I see. (Sometimes I can be captain obvious.) So I try to scan the ticket. It fails to be read. I try again. The little red light does not turn into a little green light. So I try again. Fail. The attendant takes the ticket and scans it. First time. Then I go to scan the second one but wait, there’s a message that says I have to press finger on finger pad. I look and see it and put my finger on it like anyone who’s told to do something by an electronic message kinda just does it. I move my finger around until another little red light goes green. This process is repeated three more times, though the youngest did not have to have his finger scanned. Silly them, if they had to worry about anyone jumping in the shark tank or wanting to ride a turtle, it would be him. I suspect in years to come, he will be on many ‘banned’ lists. Everyone kinda photobombed this one. But we got it done about as fast as everyone else which is to say, not fast at all. There weren’t massive crowds, but I just know that when they come and come they will, I think that whole process will be a nightmare. Better to have someone take the tickets, grab you finger, jam it into the finger scanner and have you on your way. Now what to do first? 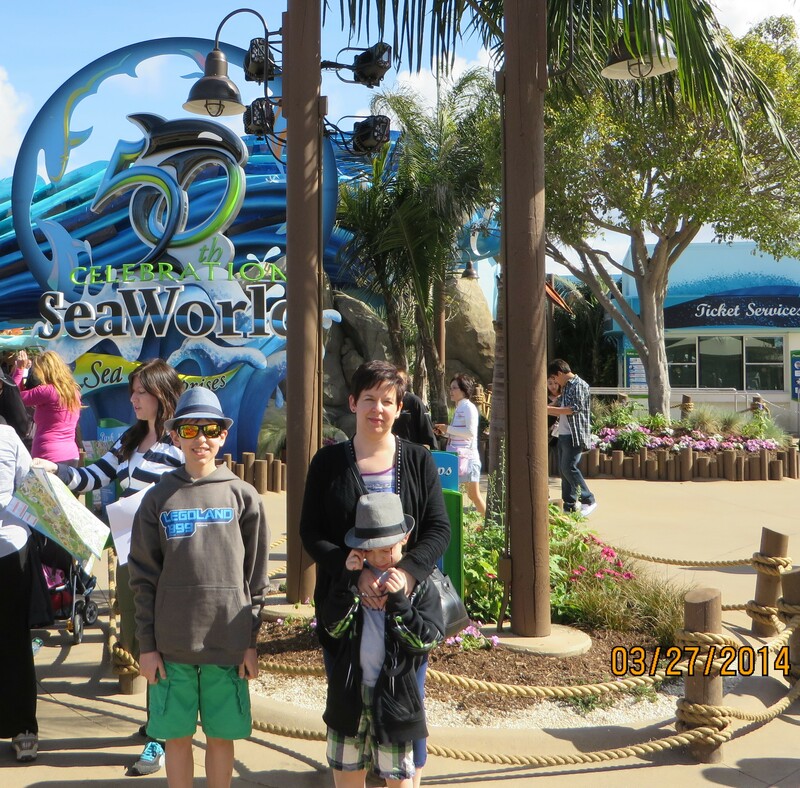 This entry was posted in Blogging, Parenting, San Diego, Travel, Traveling with Kids, writing and tagged dolphins, getting into san diego seaworld, marine animals, orca whales, parking at seaworld, preferred parking, prettiest girl in the world, rides, searches at seaworld, theme park. Bookmark the permalink.